Your company’s vehicles are mobile billboards advertising your company everywhere they go. You can have the entire vehicle covered with a vinyl vehicle wrap. 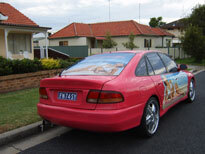 A wrap covers all the surfaces of the vehicle with your message or design. Most commercial vehicles have some type of advertising on them. In the past, the common practice was to have the company’s name, address, phone number and website name painted on the sides of the vehicle. The vinyl wrap can include pictures of your products, your logo, even a picture of you and your team. Your company’s vehicles are mobile billboards advertising your company and message everywhere they go. Studies show that vehicles with advertising on them leave over 10,000 impressions a day. Now that’s a lot of very low cost advertising. Vehicle vinyl graphics can be as small as a single decal, or as large as a full wrap. With a full wrap, the entire vehicle is covered, except the front windshield, the driver, and front passenger’s windows. It is against the law to obstruct or diminish the visibility from these windows. Rear passenger windows and the rear windshield may be covered, but typically, they will be wrapped with a perforated vinyl that allows for visibility from inside the vehicle. Vinyl wraps are typically a 3-mil hi-performance vinyl covering that is applied directly to your vehicle. The wrap looks like a custom paint job. Not only highly visible, car wraps are a highly effective marketing tool. The origins of a complete vehicle wrap are unclear. For the first few years, the materials were limited, and the process of printing and applying the graphics was time-consuming, expensive, and difficult. However, these graphics have such a positive impact that the potential advertising value is undeniable. The technology has improved tremendously and installers have honed their craft. Photo-realistic graphics are now available, as are reflective graphics and laser-cut vinyl. All vehicles, including those with extremely difficult compound curves are now able to be wrapped. Vehicle vinyl wraps offer the lowest cost and highest impact of any traditional advertising method. A van or truck wrap usually costs less than $3000.00. The average business leases the vehicle for 4 years. This equals a monthly cost of $62.50. In addition, marketing studies show the visual retention rate is very high. Potential customers recall the vehicles with a wrap more than 50% more often than other visual ads. The wrap can safely be removed when you’re ready to sell the vehicle or when the lease ends. And, the vinyl vehicle wrap has protected the paint on the vehicle, which translate into higher resale or trade-in values. More information about Newcastle vehicle graphics, newcastle vinyl car wraps, magnetic vehicle signs and vehicle graphic designs are contained in this site. 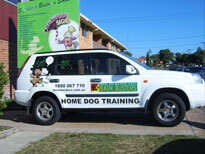 Bark Busters work vehicle with new signage and vehicle wrapping. Read more about vehicle graphic designs. Mobile spray tan car with vehicle graphics wrap and window film. Read more about vinyl car wraps.